Your family’s memories are at risk. Never miss capturing that magical moment again due to the dreaded “Storage Full” error! If your favorite photos and videos aren’t saved somewhere besides on your smartphone, you’re asking for trouble. We'll explain how you can backup and protect your family’s memories in 1-click with this amazing new invention! 1 in 3 smartphone users will lose ALL of their photos and videos from water damage alone! This could include once-in-a-lifetime - wedding photos, family vacations, anniversary pictures, or even a video of your grandchild's first steps. These priceless photos and videos with friends and family – GONE in the blink of an eye! Now here's the dilemma many face - no one wants to spend hours moving and organizing years-worth of photos onto a storage device. And a professional digital photo organizer can cost you some serious money ($500-$2k+ serious)! "But, what about the Cloud? That’s safe and easy, right?" You’d be surprised. Many people are quick to acknowledge that their photos are “stored in the Cloud”, but can’t tell you exactly where those private memories are being held – or who else might have access to them. Even fewer could explain how to get those memories back without needing an Internet connection. Not to mention those subscription costs. Paying $120 a year, every year, indefinitely? Not a chance. Imagine being able to sort and save TENS of THOUSANDS of photos and videos, with practically no effort (or recurring costs). Then, being able to tuck that “digital gold” away in any safe place you please. Meet ThePhotoStick Mobile – quite possibly the simplest, least-expensive digital organizer on the market! Step 1: Plug ThePhotoStick into your phone (works for both Android, iPhone, and iPad). Step 2: Download the FREE app. Step 3: Click ‘Backup Now' and FINISHED! That’s it. ONE click and you’re DONE. No-nonsense. No hassle. No time lost. Unlike ordinary thumb drives or bulky external drives, ThePhotoStick starts organizing your photos from the second you click “Backup Now”. It instantly scans every inch of your phone, searches through every file and folder for your photos and videos, and automatically downloads and backs up all your photos and videos. PLUS, you can easily transfer those backed-up files to any computer for extra peace of mind! "But I have multiple phones with tons of photos & videos..."
Not a problem. ThePhotoStick Mobile works with multiple phones. It also works with both iOS and Android - simply plug it in to each phone and click “Backup Now”. That’s it! Think about it. What would normally take HOURS and HOURS of searching, selecting, saving, and organizing can be done for you in a single button click for much cheaper. With PhotoStick you drastically reduce the risk of losing the memories on your phone. So, how much does this "Memory Vault" cost? Here’s the remarkable part - would you believe me if I said you can get a PhotoStick for under $100? Yep – it’s true! ThePhotoStick Mobile with 32GB of storage retails for $64.99. That's less than a family dinner! 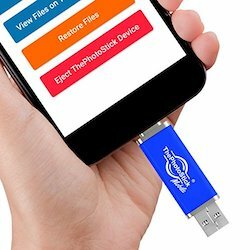 You can purchase ThePhotoStick Mobile with 32GB of storage directly from the company’s official website by clicking here. Step 1: Order ThePhotoStick Mobile here and get it delivered in 3-5 days. Step 2: Plug it in and open the FREE ThePhotoStick Mobile App. Step 3: Click ‘Backup Now’ and there you go – done! As of Apr 20, 2019, Ceeny subscribers can still get ThePhotoStick Mobile with 32GB of storage for 40% Off! PRO TIP: The PhotoStick Mobile is perfect for the photo enthusiast in the family, but also great for those who simply lose their photos or phones often.